1st February, 2007. In this issue: ExplorOz Site Stats, Full Article Rewrites: Snorkel, Bull Bars, Rails & Steps and Suspension Upgrade. Schools around the country may have resumed classes this week but the year is already flying ahead as we bring you our third newsletter edition for 2007 and move into February. If you’re fortunate enough to travel outside school holidays now might be the ideal time to visit areas that have been busy over summer, or perhaps your next trip starts in Easter (just 9 weeks away). In either case, be sure your vehicle is setup safely and plan well in advance. In this newsletter we launch 3 articles on vehicle accessory products, and as usual our Shop has new books and maps designed to interest you. 1. At ExplorOz, a user session (visit) is the presence of a user with a specific IP address who has not visited the site anytime within the past 30 minutes. A user who visits at noon and then again at 3:30 pm would count as two user visits. But a user who visits at noon and stays active on the site until 3.30pm would only count as one visit (provided there was no period of inactivity for more than 30 minutes). Other measures are also reporting an increase, with Page Views across the site up by 22% to 7.3 million for the month of January. At ExplorOz, we report the actual raw data measured by the server, however due to our current conversion activity this number is artificially inflated. 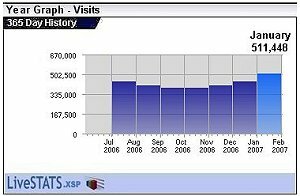 The estimated Page View figure is closer to 3 million unique pages for January, which is still a very significant number. Although we also measure Hits, and it’s a huge number, this is not used to measure the volume of visitors to a website. The retrieval of any item, like a page or a graphic, from a Web server is counted as a Hit. For example, when a visitor calls up a Web page with four graphics, that's five hits, one for the page and four for the graphics. However, ExplorOz Hits are also up by 25%	to over 38 million for January.